We can check if all values in a range are greater than or equal to a certain number by independently using or combining the COUNTIF, IF and NOT functions. This tutorial will step through the process. We will use data of test scores for 5 students in 5 subjects they offered in a semester. The COUNTIF function checks the specified range for values that are greater than 78. 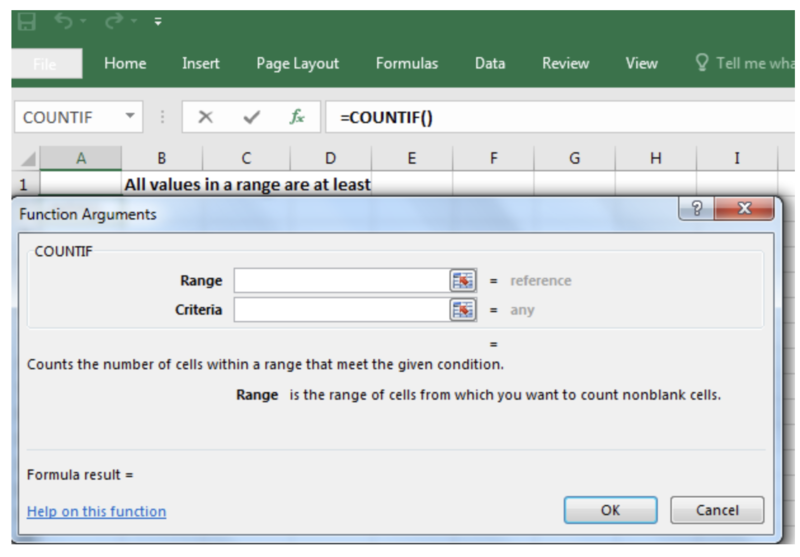 It returns the count of the number of cells that have values greater than 78 as the result. This result shows that three students scored less than 78 in all subjects. The COUNTIF function checks the specified range for values that are greater than 78. It returns the count of the number of cells that have values greater than 78. The IF function returns TRUE if the COUNTIF function returns at least a cell that fits the criteria and FALSE if otherwise. The NOT function works by returning the opposite of what COUNTIF says. In this formula: =NOT(COUNTIF(B4:F4,">78")), COUNTIF returns three cells with values greater than 78 and the NOT function returns FALSE as the OUTPUT.